Prevail Premium Fluff Underpad - Large - 23" X 36"
All Prevail and First Quality Underpads feature an Integra Mat or bonded construction that reduces top sheet separation and clumping. For added comfort and skin health, all of Prevail and First Quality Underpads also feature a soft, yet strong cloth-like top sheet with a flat seal around the pad there are no plastic edges exposed to the skin. Many users rave about how easy and reassuring this product is. It doesn't tear, leak, or shift around like other similar, cheaper products. They are comfortable to use and can be used anywhere that you need a little extra protection. These pads offer super protection against urinary incontinence, and are 100% disposable. Available in a variety of sizes and absorbencies, Underpads are designed to protect beds, chairs and other surfaces. 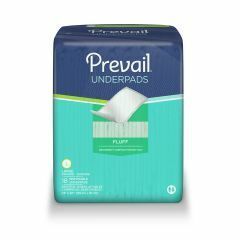 All Prevail and First Quality Underpads feature an Integra Mat or bonded construction that reduces top sheet separation and clumping. For added comfort and skin health, all of Prevail and First Quality Underpads also feature a soft, yet strong cloth-like top sheet with a flat seal around the pad there are no plastic edges exposed to the skin. Good product. Absorbs well and is strong. I like the larger size. Most pads are 24x36, which do not cover the bed because they shift around as you're getting patient in the bed. Protective. good value. great for back up pad. These pads are used on top of the heavy backed cotton pads to avoid excessive laundry. I am able to cut in half and they work perfectly. Used with an incontinent adult. What is the weight in pounds and dimensions in inches of the case? How is the product folded (bi vs. tri)?